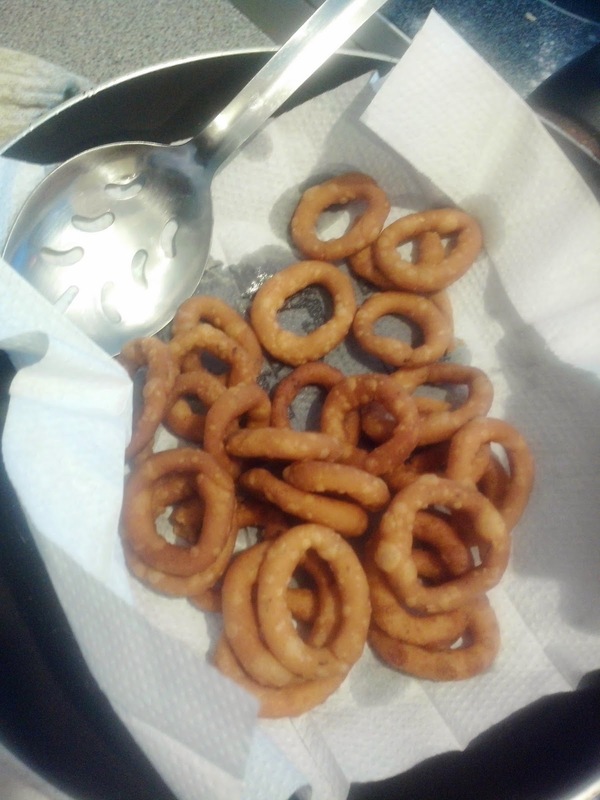 Pavi's Platter: Ring Murukku /Chegodilu! A very very happy Diwali to everyone. Let the festival of lights bring joy and happiness in everyone's life. Have a safe Diwali. I tried Patisa/Soan Papdi for the Diwali Sweet and Chegodilu for the savoury quotient. Patisa didnt turn out great as i tried for first time and as i tried with brown sugar the sugar syrup confused me with the consistency and color. Will try it out again with white sugar and post soon. 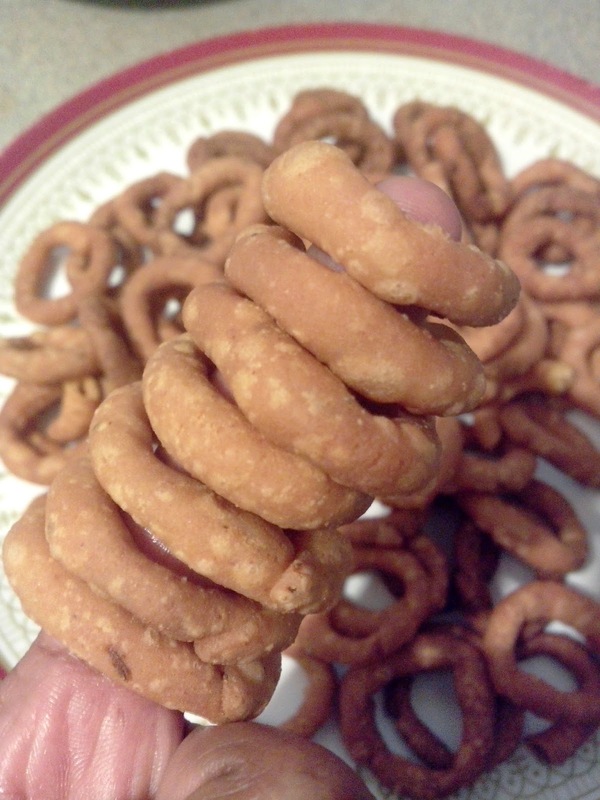 Coming to Ring Murukku, a very quick and crispy snack with minimum ingredients. I had to choose this as diwali snack as i didnt have murukku press. Add one cup of water to a vessel and bring to boil. Add butter and salt to it. Add the rice flour and urad dal flour to it and mix well until it becomes a dough like shown. Let it cool for sometime and then add other ingredients and mix well. Pinch small balls of gooseberry size and roll it to a thin rope form. Join the ends together and slightly pinch it and form a ring. Do the same for the remaining dough. 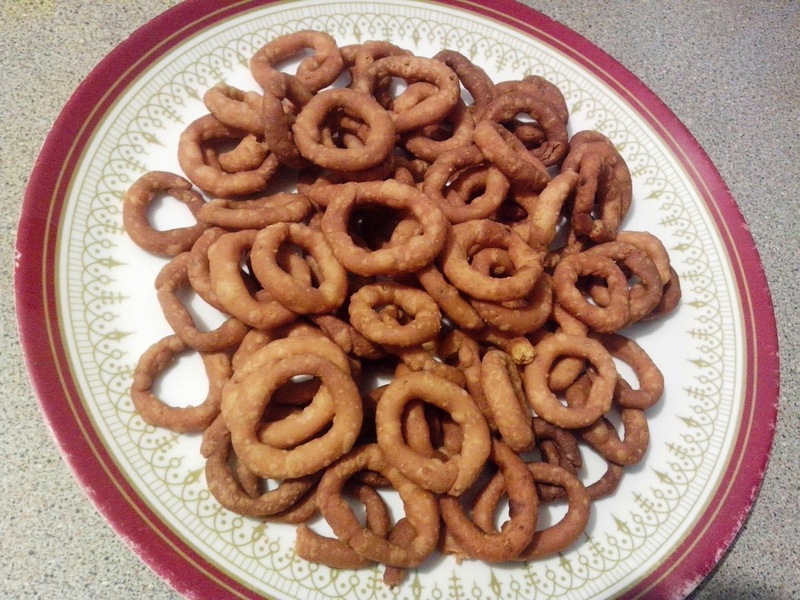 Heat oil in a kadai and once oil is heated enough drop the rings carefully and fry them/. Turn them now and then for even cooking and browning. Remove them once they are golden brown and place it on paper towel to remove excess oil. Try this simple recipe and enjoy your diwali. See you soon with another interesting recipe.